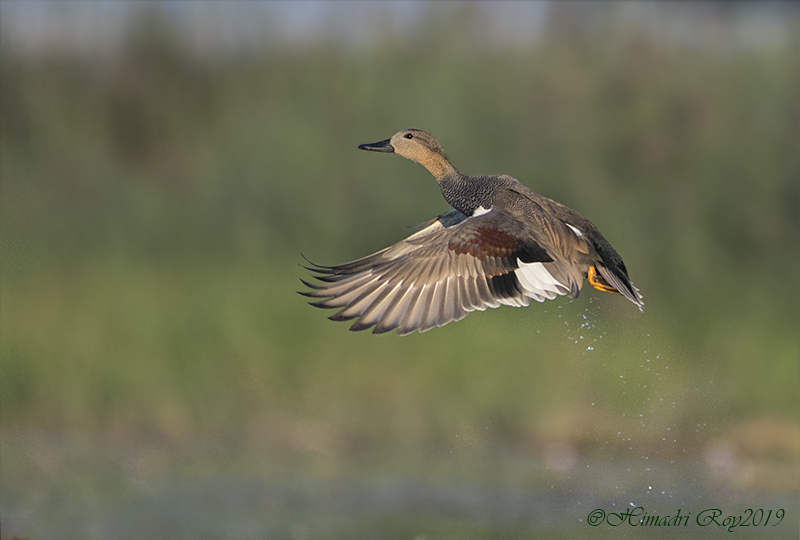 f/5.6 , @1/2500 , ISO - 1000.
well taken flight shot and fine details on the duck as-well, sweet one HIMADRI. Lovely flight shot in pretty light- complete with droplets. Himadri, a top-notch takeoff shot. Beautiful flight position, and lovely trailing water droplets. Excellent. Love the wing position. Nice look at the speculum and the trailing water drops add to the comp. Very Nice! Wonderful take off capture with superb feather detail, colours and complementary background. The falling water droplets are the icing on the cake. Fantastic shot, Himadri! Nice blast-off. It takes knowing the clue as to when it will happen and panning in time, at the right speed and correct upward angle. Skillfully done. Superb take-off shot Himadri! I love the droplets trailing behind , giving a good sense of motion.